The recent unexpected spell of overly warm weather (AKA summer) has meant that I have actually managed to get bread dough to prove in a timely fashion. I am a novice baker and this is the third time I've attempted to make bread. 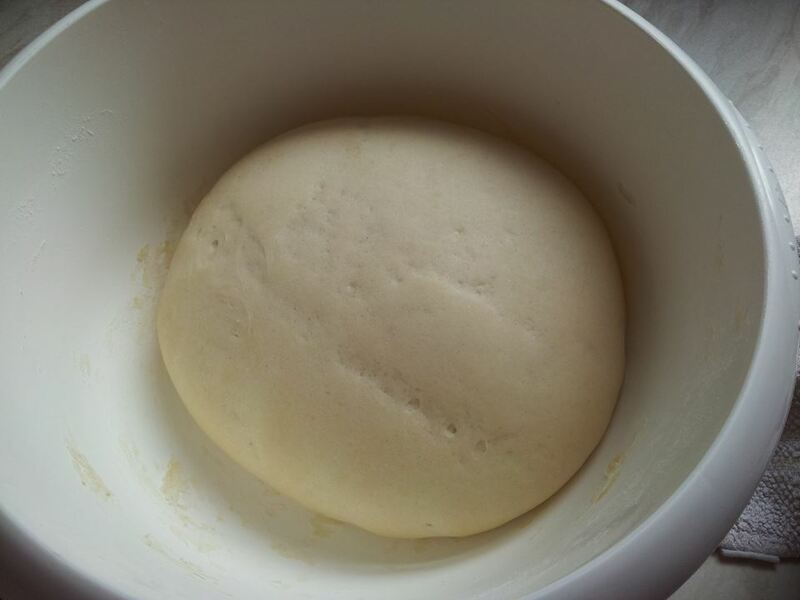 The first time, the dough rose but very, very slowly taking over five hours to double in size. The second time was a couple of weeks ago and there was no sign of activity from the yeast even after waiting twenty four hours. I wasn't expecting great things when I decided to give it another go yesterday morning, so much so that I did the mixing and kneading myself whilst singing Old MacDonald with M (aided by fuzzy felt) rather than involving her in the first stage. Kneading done, I covered the bread dough with a tea towel then made the decision to put the bowl on the back step which is something of a sun trap. M and I played in the garden for forty five minutes and when I checked on it, the dough had more than doubled its original volume. Hurrah! 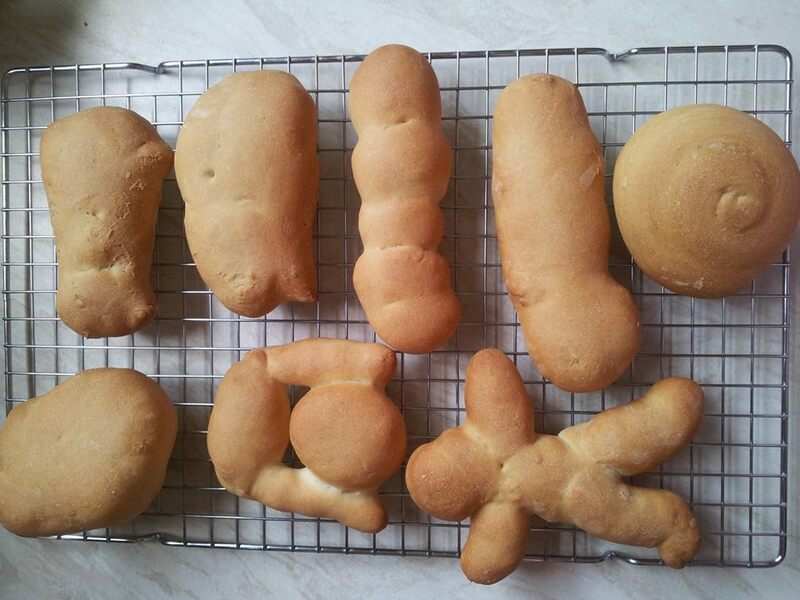 It took some doing but I persuaded M to leave her garden swing and we headed inside to make bread rolls. 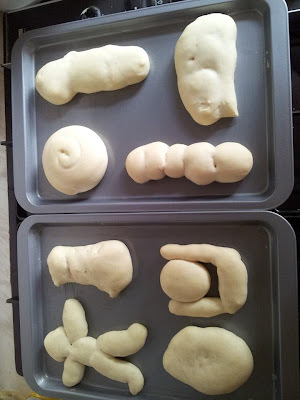 M and I knocked the dough back before taking it in turns to knead it again, then I divided it into eight pieces. We greased a couple of baking trays then M shaped four rolls and I shaped the remaining four under her supervision. It was very exciting, I could see the dough trying to rise even as we were working it with fresh bubbles trying to form even as we shaped it. Under the tea towel the rolls went while I made lunch, this time leaving them on the kitchen table and another forty five minutes later... We had dough which had proved for a second time. Into the oven the rolls went and eighteen minutes later we had these cooling on a tray. I did a happy little dance while the more pragmatic M asked if she could eat them. Eat them we did and I can report they were tasty although I think they could have done with a bit more salt. I still need to get bread to prove without the aid of a hot summer day as well as work out how much salt will not kill the yeast, but yesterday at least we actually baked bread.